TOO much Christmas pudding cost jockey Craig Franklin dearly when weight problems forced him to give up riding the first two winners at yesterday’s Coffs Harbour TAB meeting. Peter Graham was the lucky substitute jockey and steered both horses across the line at long shot prices. 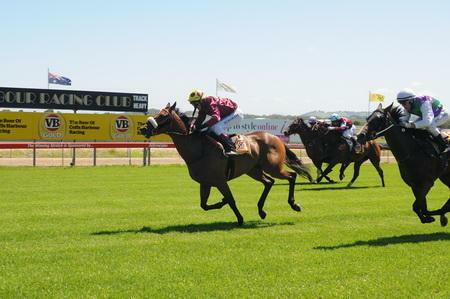 When trainer Neil Godbolt brings a two-year-old north they invariably run well and he duly collected the purse in the Coffs Hotel Maiden Plate (1000m) with first starter Never Doubt Me. Eventual runner-up Triple Treats did most of the bullocking work down on the rail in front and looked to be holding the others at bay by the distance, until the daughter of boom sire Not A Single Doubt appeared from the ruck and just outstayed him to the line. “I always make sure to have them well-educated when they come to the races and she’s been going along all right,” Godbolt revealed. “But to be honest, the win caught me out as I wasn’t sure she’d handle the heavy ground. In the second race, Graham arrived at $41 bolter’s odds on the Joanne Hardy-trained Indoshadow. Ironically, the favourite Wind Of Dubai was sent out by the trainer’s father, Trevor, and after making an effort to improve in the early stages the hotpot soon found itself going backwards at the rate of knots. The win was Hardy junior’s second in her debut season after breaking through last October and she had plenty of reasons for the improved effort by the three-year-old gelding. “I didn’t have a bet on him as I thought it would be a hard race to win but his trackwork’s been really good,” she said. “He has been unlucky by drawing wide barriers and has been stuck out wide without much luck in running.